Edwinna Elbert, a Breton mage, is a Wizard of the Mages Guild. 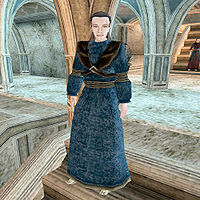 Edwinna Elbert can be found in the Guild of Mages in Ald'ruhn. She is one of the people who will let you join the guild and is the primary quest giver in the Ald'ruhn chapter of the Mages Guild. She is a very dedicated scholar of the Dwemer, and, according to rumors has almost figured out how to create her own Centurions. As such, the majority of her quests revolve around her Dwemer-related studies. She is not above using theft if it aids her research. She has been witnessed by the Guild's doorman, Orrent Geontene, in saying that Arch-Mage Trebonius Artorius doesn't really care about scholarship. Edwinna is wearing a common robe and expensive shoes, and carries a silver dagger and an ebony Wizard's Staff. Aside from her natural bonus and resistance to magicka, and her ability to shield herself for short periods, she knows the following spells: Rapid Regenerate, Poet's Whim, Vivec's Mercy, Powerwell, Surpassing Green Wisdom, Masterful Green Wisdom, Surpassing Unseen Wisdom, Masterful Unseen Wisdom, Blood Gift, Blood Despair, Absorb Willpower, Absorb Intelligence, Drain Blood, Wild Spelldrinker, Weak Spelldrinker, Reflect, Medusa's Gaze, Dire Weakness to Frost, Dire Weakness to Fire, Drain Restoration, Drain Mysticism, Wild Distraction, Strong Shock Shield, Second Barrier, Strong Frost Shield, Strong Fire Shield, Great Feather, Dire Weary, and Burden of Sin. [Disposition ≥ 30] "What's so important that you would interrupt my studies? If you must have duties for the Mages Guild, I suppose I could think of something." [Disposition ≥ 30] "More interruptions, %PCRank? Do you want more duties? Why are you here?" "Well, don't just stand there. Have you found a copy of Chronicles of Nchuleft or not?" "Did you get that Detect Creatures potion from Skink?" "What did you find at Huleen's hut? Was it worth all these intolerable interruptions?" "Have you found a Dwemer Tube? Many of my studies cannot continue until I have one in my possession." Ald Velothi: "Take the Silt Strider to Gnisis and follow the roads north. I will mark Ald Velothi on your map." Antecedents of Dwemer Law: "I know I purchased my own copy from Codus Callonus here in town. I think someone else asked for a copy, some local servant of House Redoran." Chair of Dwemer Studies: [Disposition ≥ 40] "Currently, the Chair is empty and the Great Houses can't agree on a replacement. I believe Hasphat Antabolis was nominated... I'd try to get the position myself, but I fear all the meetings and bookkeeping would take time away from my research." "It is the sixth volume of Marobar Sul's "Ancient Tales of the Dwemer." Most of the "Ancient Tales" are not truly Dwemer in origin, but this one may be an exception. It deals with some sort of golem or centurion. Would you be willing to "borrow" this book for me?" Yes. : [2 Scroll of Ondusi's Unhinging has been added to your inventory] "Thank you, %PCName. Sirilonwe probably keeps the book near her in the Mages Guild in Vivec. Do whatever it takes to get the book and then return it to me. If you're caught stealing, of course, it is a crime against the guild, so be careful. And take these scrolls just in case." "Just go to the Mages Guild in Vivec, find the book Chimarvamidium, and return it to me. I'm certain that Sirilonwe has a copy, though she may claim otherwise." No. : "Don't think of it as breaking your oath to the Guild, %PCName. It is just a small favor. For the advancement of the art and science of magic. If you're caught, of course, you will have to accept the consequences." "You have a copy of Chirmarvamidium? Will you let me borrow the book?" Give her the book. : [Disposition +10, Chirmarvamidium has been removed from your inventory] "Thank you, %PCName. I will return the book to you soon, but in the meantime, I have more duties for you." "I have not had a chance to study the book. Have patience, %PCRank." Keep the book. : [Disposition -5] "That is very disappointing, %PCName." "Can you believe this isn't about a Dwemer construct at all? This book was completely useless. In any case, I need you to return the book before Sirilonwe suspects anything. Return the book to wherever you found it." "Like I said, take Chimarvamidium back to the Mages Guild in Vivec. Make sure you put it back exactly where you found it." [Disposition +10, Amulet of Almsivi Intervention has been added to your inventory; Amulet of Divine Intervention has been added to your inventory] "The book has been returned? Good work, %PCRank. Once I know the locations of some Dwemer ruins, I will be asking you to travel to some dangerous places. These amulets will help you return to safety." "While Chimarvamidium was not as useful as I'd hoped, I do appreciate your efforts." 'It is a rare Dwarven tome. None of the Mages Guild branches have a copy, and it is simply *essential* to my research. Would you be willing to find a copy for me?" Yes. : [250 Gold has been added to your inventory] "Excellent. Here's 250 septims to cover your expenses. Time is of the essence." "I simply *must* have this book for my research. Use the gold I gave you to find a copy. Maybe one of the booksellers has one." No. : [Disposition -5] "I guess I'll have to get Bribanne Erien to do it." "You actually found a copy? Excellent, now give the book to me." "What? You already have a copy of Chronicles of Nchuleft? I am impressed with your scholarship, %PCName. Are you willing to part with the book?" Give her the book. : [Disposition +10; 1 Chronicles of Nchuleft has been removed from your inventory] "I'm impressed, %PCRank. I hope you are always this efficient." 'Chronicles of Nchuleft has been invaluable in my research." Keep the book. : [Disposition -5] "I thought we had an agreement, %PCName. Apparently your word cannot be trusted." "It's simply taking Skink-in-Tree's-Shade forever to finish it. Go to Wolverine Hall in Sadrith Mora and bring the potion back to me as soon as Skink is finished." "Just go talk to Skink-in-Tree's-Shade in Sadrith Mora and bring back the Detect Creatures potion." "Ah, at last you've brought me a Detect Creatures potion. Will you give the potion to me now?" "Oh? Where is the potion? Do you have it with you?" [1 Potion of Detect Creatures has been added to your inventory, 1 Exclusive Potion of Shadow has been added to your inventory] "Excellent. Why don't I give you a potion more useful to a %PCRank in the field?" "I appreciate the potion, %PCName. It will prove very useful." No: "Unlike a proper %PCRank, you do not keep your word. I certainly am not going to give you any more duties until you deliver a Detect Creatures potion to me." "Yes, %PCRank, there is something you could do for me. I am looking for a copy of the rare Dwarven book Chronicles of Nchuleft." "I have been waiting for *ages* to get a Detect Creatures potion from Skink-in-Tree's-Shade in Sadrith Mora." "Sirilonwe in the Mages Guild in Vivec has somehow acquired a copy of Chirmarvamidium." "I have been distracted from my studies by several reports from Maar Gan. Apparently there is some sort of disturbance at Huleen's hut." "Yes, %PCName, I have finished my study of Chimarvamidium." "I'm so glad you asked, %PCRank. At this delicate phase of my research, I need to study a Dwemer Tube." "It's a shame the Mages Guild isn't led by someone with your devotion to Scholarship. Perhaps if you speak with Trebonius, you can make him listen to reason." Yes. : [Disposition +5] "I appreciate your dedication, %PCName. Arkngthunch-Sturdumz is northwest of Gnisis, but there's an easier way to get there. Go to Ald Velothi and follow the coast to the west." "Dwemer Tubes shouldn't be too hard to find. Go to Ald Velothi and travel along the coast to the west. You'll cross a bridge and you'll see Arkngthunch-Sturdumz ahead of you. You can't miss it." No. : [Disposition -10] "I'm disappointed, %PCName. You are obviously not truly dedicated to research. If you're concerned about Imperial Law, there's no need to worry. I will, of course, turn the device over to the Chair of Dwemer Studies... just as soon as I've finished my research." "Since Huleen is a member of the Guild, we really ought to do something about the disturbance. I simply haven't had time to do it myself. My research is af an absolutely critical phrase. Would you go to Maar Gan and take a look for me?" Yes. : "Excellent, %PCName. Go to Maar Gan. I'm sure someone there can give you further directions. Take care of this for me so I can continue my studies in peace." "Just go to Huleen's hut in Maar Gan and find out what's going on. Don't distract me from my work, %PCName." No. : "Well, maybe Tarancur can do it. I'll ask next time I see him. You're not the only %PCRank we have, you know." "You've been to Huleen's Hut? What happened? Is her apprentice okay?" [Disposition +10; 2 Scroll of The Fifth Barrier has been added to your inventory] "So Huleen's apprentice summoned a scamp? Is that all? I can't believe I was distracted from my studies for something so trivial. Speaking of which, I discovered these scrolls during my research. You may find them useful." [Disposition < 60.] "I might believe your story if I knew you better. What did you really find at Huleen's hut?" [Disposition ≥ 60] "That is unfortunate. If he could summon as scamp with such little training, he had promise." "I'm trying to forget about it." "The Guildmaster? Well, he's certainly a powerful Battlemage, but what has he accomplished? I wish the Guild were led by someone who showed more respect for scholarship... Especially with all the interesting things to study here in Vvardenfell." "I wish the Guild were led by someone with your respect for scholarship, %PCRank. Perhaps you could speak with him and make him see reason."